In case you lost track of the date, it's September 24th, which is just one day before September 25 and the official release of Marvel's The Avengers on DVD and Blu-ray. Those of you who are planning to get the 4-Disc Combo Pack will not only have numerous ways to watch the movie (Blu-ray, Blu-ray 3D, DVD and digital copy), but will also have access to additional bonus features, including downloadable music from and inspired by the film, a second screen app and a "free" poster. We'll put the "free" in quotes because you have to send away for it and there's a shipping fee, but those who want to see what it looks like can check it out ahead! 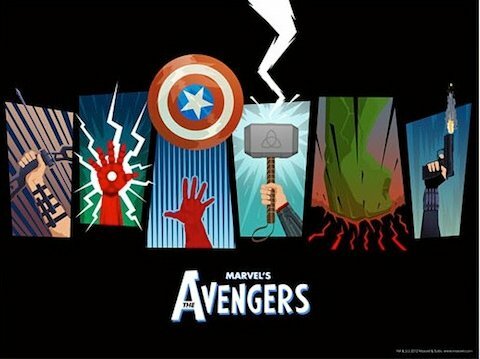 It's 24" x 18" and as you can see, offers a nod to each of the Avengers, starting with Hawkeye, Iron Man, Captain America, Thor, Hulk and Black Widow. You have to pay $3.59 for shipping and handling, and it takes 6-8 weeks for it to arrive. The offfer expires 1/31/2013 and according to the offer site, it's available with all packs. The hulk one is my favorite, though I really love the look of the "I survived the Battle of New York" poster. The Avengers arrives on Blu-ray/DVD Tuesday, September 25.